We want to bring your attention to a report on The International Assessment for Agricultural knowledge, Science, and Technology for Development (IAASTD). We find this report to be of paramount importance. More than 400 scientists in 4 years summarised the state of global agriculture, its history and future. This report released in 2008 promotes a global shift towards low input sustainable farming as the way forward. See Executive Summary of the Synthesis Report, pages 3-11 of the link above. Hear Hans Herren, one of the IAASTD editors talk about consumers hold the key to the future of food and farming. This decade urgently needs to be dedicated to renewing our relationship to seeds and crop-plants. We need to learn to value them and to re-skill as seed-savers at local levels. We might well need these skills in the coming years. Open Pollinated Seeds is an initiative to spread awareness about the importance of the natural ways of propagation and regeneration in the plant kingdom. An important feature of it is to high-light the fact that availability of Open Pollinated seeds for food production in Europe has drastically been reduced during the last 30 years. We encourage you to be informed about this key issue which is at the heart of our food culture. The pages on this site are built to give you information and insight, and to connect you with resources you might need to make informed choices regarding your food culture. As you will see, a logo has been designed as an identification symbol for Open Pollinated seeds and produce. If you are a seed and vegetable grower and gardener we hope that you will make use of the logo so that the public may come to recognise the symbol as being synonymous with Open Pollinated produce and seeds. The term Open Pollinated should also refer to the grains as many modern grain species are produced as hybrid varieties, therefore the term ‘Open Pollinated’ is quite appropriate to help distinguish breeding methods of modern cereal varieties. We offer practical skills for seed-saving through talks and workshops and promote seed-swapping events. We encourage and promote cross pollination of ideas and connections between people, to strengthen and make widely known the concept of Open Pollinated Seeds, nature’s key to diversity and resilience. This initiative is lead by Peter Brinch. Peter worked as Biodynamic Seed Development Officer between 2002-2006. Because of the critical role of the seed, Peter together with Pupak Haghighi established the Open Pollinated Seed initiative in 2010 to bring this central issue to public’s attention. If you are moved, as we are, to protect and promote this free agent of life and biodiversity, get in touch and become active. You can invite Peter Brinch for a seed talk or workshop, organise a seed-swap day in your community, give away open pollinated seeds, just as nature does, with no patents or strings attached. This website is to clarify and bring you into contact with what open pollinated seeds are about and why recognising them is so critically important now. * 2011 – 2020 declared as Decade of Biodiversity by the United Nations. * International Day of Biodiversity: 22nd May – each year events are held all over the world to celebrate this day. The photographs are not in all cases related to the type discussed on the page. • One obvious way is to grow them. OP varieties can be sourced through seed catalogues. Please see seed links page. • Identify seed types on seeds packets when buying seeds direct from garden centres, hardware stores and agricultural merchants. If there is no F1 written on the packet (front or back), then it is an open pollinated variety. • A logo has recently been designed for identification of open pollinated varieties and seeds. Please use it generously and tell others about its existence. • Another way is to buy OP produce or ask for it. Farm shops, farmers markets and box schemes can now identify their open pollinated produce through using the suggested logo. • Experience the wonder and beauty of how your vegetable species go to flower and seed by allowing them to do so. It’s fascinating, revealing and the insects love it. • Learn to save seeds of some of the species that you grow by attending seed saving workshops. • If you know the essential principles of seed saving, offer workshops and share your knowledge, your experience and your insights. • Adopt an open pollinated variety and maintain it through saving its seeds. 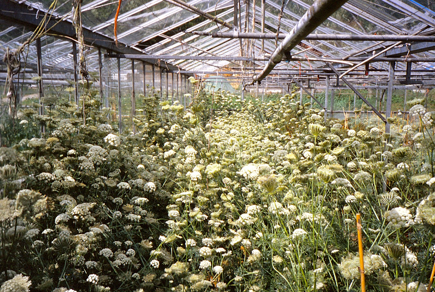 • Become an open pollinated seed producer. • Be an agent and tell others about open pollinated varieties and seeds. Seedy Sunday 2013, Brighton Seed Swap at the Corn Exchange, attracting more than 3,000 people. With thanks to Leonard Gouzin from Food Matters.